The spirit and soul of Southern ItalyEnzo Avitabile & I bottari(Italy)BiographyAvitable fuses powerful vocals, catchy melodies with his remarkable musicianship all to the spectacular rhythms & traditional folk sounds of I bottari. The result is a dynamic & contagious (Los Angeles Times)Enzo Avitabile has earned world acclaimed as an award winning singer, song writer, and master instrumentalist. Born in Naples in 1955 he began playing the saxophone when he was seven, and soon after began studying formally at the Conservatory of Music San Pietro where he earned his degree in music as an accomplished flutist and Saxophonist. Avitabile found himself surrounding by a diverse musical influences in the late sixties including American Jazz and soul. 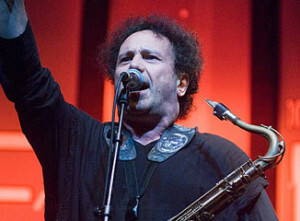 He recorded his first album in 1982 “Avitabile” which showcases Enzo?s love of jazz and its unconventional structure, spontaneously creating fresh melodies over the continuously repeating cycle of chord changes of a tune that will be vital element in his future exploration over the next years. …. He then went on to record a series of albums including Meglio Soul in 1983 (once again dedicated to American Soul and his idols James Brown whom he later would perform and collaborate with. Correrein Fretta 94? , SOS Brothers in 86, Alto Tensione 88, Stella Dissidente 1990, Enzo 1991, Easy in 1994, Addo in 1996, and O? Issa in 1999, which included such jazz greats as Randy Crawford, Richie Havens and great stars of Soul and Motown James Brown and Tina Turner to name a few cementing Enzo Avitabile and the number one and most renowned jazz recording artist in Italy. Still on a musical journey of blending the past with the present in 1996 Enzo found himself returning to his roots writing songs about the poor and marginalized of his native city in a Neapolitan dialect. This fascination for the deeply religious and yet enticingly pagan and carnivaleque folklore of the Compania region eventually lead him to the Bottari, or barrel-beaters of the Porico di Caserta. The story of the Bottari?s started 700 years ago in Campania, Italy, when farmers banged on barrels and vats to drive away the malignant spirits from the dark corners of their wine cellars. Eventually this ritual became part of the celebration of St. Anthony the Abbott. Every year, commemorating his day on January 27, decorated wagons would parade through the small town of Portico. One of the wagons would contain a group of young people, called a pattuglia, or patrol, who?d hammer out their rhythms on barrels and vats, or hit scythes with steel sticks. Under the direction of a Capopattuglia (Chief of Patrol), the musicians executed three specific rhythms: the pastellessa, with its wild, violent patterns; dead music, slow and mournful; and finally the tarantella, the basis for the famous traditional songs.Local resident Pasquale Romano heard the music they made and had a vision of something bigger. Adding guitar, violin, accordion, bass, flute, and the old Italian shawm called the ciaramella, he took the rhythmic traditions of Campania to the concert hall. From 1989 to 2000 the group known as Bottari electrified audiences throughout Europe with the deep, ancient sound. Then, in 2001, they met Enzo Avitabile and the real dream of bringing this sound to world audiences began to take form. Together, Enzo Avitabile and Bottari set about forging a new language that their instruments could speak together. They worked on the collaboration for three years, playing and writing until they understood they had something unique to offer the world.Only then did they go into the studio. But by then word of the project had leaked out, and a veritable array of global stars were eager to be a part of this new sound including Tunisian diva Amina, Palestinan oud & Violin virtuoso Simon Shaheen, and Hugh Masakala, and Algerian Ra� superstar Khaled (Cheb Khaled). They all make appear on Salvamm?o Mummo (Save the World), showing how music can cross borders of geography and imagination in its presentation of thrilling music. The album became a sensation ? but so did their shows. As the Evening Standard declared of their show at London?s Jazz Caf�, “the pagan excitement of the drums infects audiences.” The primal power of barrels, vats, and scythes can be a very deep music indeed, especially when mixed with Avitabile?s playing and singing. It?s a passionate sound, where the past meets the present to create a fusion that?s utterly new.” The result was an truly magnificent record ” Salvo the traditional sounds of the south of Italy specifically from the region of the Compania. Salvammo?o Mummo exploded onto a jaded world music scene. CDRoots.com called it ?the most original world music album of the year,? while Songlines classed it as ?a remarkable album, unlike any other.? And a phenomenal performance at WOMAD 2004 and numerous world festivals that followed the release, increasing raised their profile world music lovers. However the seal came with the nomination in the BBC Radio 3 World Music Awards. ENZO AVITABILE & BOTTARI were now certified world music sensation, uniting past and present in a unique fashion. For Enzo Avitabile, journey to preserve understand his homeland and speak to the people?s needs in South of Italy also brought together another amazing recording and live project in 2006 Sacro Sud where he uses the most unique master instrumentalist including Landau master Luigi Lai and rich vocals of the Polifonica Alphonsian. Enzo Avitabile, envisioned his Sacro Sud project as a meditation on the soulful vitality of people from Naples to Nazaret returning to your roots and the beauty of the soil. At its core, it is music from southern Italy, but, in actuality, it speaks to all anywhere the disenfranchised are found. Whether a traditional or an original composition, Sacro Sud evokes the lives of people erased from history, but still present in music that is direct and profound. It is a recovery of tradition in the urban environment that continues to flower as time unfolds. For music critics, Sacro Sud has been recognized for “its sparse, all acoustic settings that evoke wonder and passion (CD Roots).” Although Avitabile says the project “lays emphasis on the evils and the pain of our cities, of the many ’souths’ of the world and of the suffering people,” upon listening it is clear that Sacro Sud also contains moments of sparkling joy. This duality, delight and sorrow, hope and despair are woven throughout the sacred songs that offer praise to the Virgin Mary as well as others such as Saint Efisio, ponder the mystery of the divine birth and crucifixion of Jesus Christ, and entreat people everywhere to embrace our shared humanity. Beyond the message, there is much musically to captivate the listener. As the writer Nondas Kitsos noted, the chorus provides a liturgical [influenced] counterpointIn 2007, ENZO AVITABILE & BOTTARI recorded their second album Fiesta Farina E Forca. This album also features numerous wonderful guests including such luminaries as Bill Lazwell and Ethopian diva Gigi. This album further solidified Enzo Avitabile & Bottari as the keepers and the innovators of sounds and traditions of the South of Italy. They went on to tour in 2008 North America and Canada to sold out concert halls and festivals attended by more than one hundred thousand adoring fans. Enzo Avitabile & Bottari continue to tour Europe wowing critics and fans. 2010 will find them touring for the very first time the Arab World and working on their third album. With devoted skill, Enzo manages to blend the beats of the bottari with jazz, blues and the voices of the people of the South Saving and preserving a culture of music, all while saving the indigenous people? and speaking out for their needs?